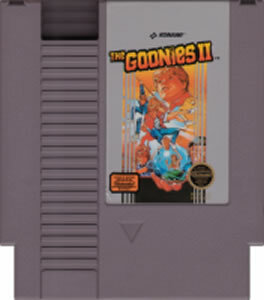 Goonies 2 original NES Nintendo Game cartridge only - Cleaned Tested and Guaranteed to Work! I love this game, from as far as I remember this is the first video game I ever played. The main music theme is excellent and it has a metroidvania feel to the gameplay. You'll have to look up at some obscure things to do but overall a great game. Also I have never seen a cartridge that looked so new it was flawless! Thaks a lot Lukie Games! I admit, I was debating ordering from Lukie, with their great prices and insane inventory, but boy am I glad I did. The free shipping leaves something to be desired, but the quality off all my games were outstanding, especially this one. It's not a collector cart or anything, just high sentimental value and i was expecting half missing labels, discoloration, beat-up, cracked, BUT NO. Besides a few MINOR, MINOR scrapes, ALL these games look pretty dang close to "out-of-the-box" new. Great business and they have earned my repeat business. SUPPORT, SUPPORT, SUPPORT! Why are you reading this?? Buy it now! This was my favorite game when I was a kid. 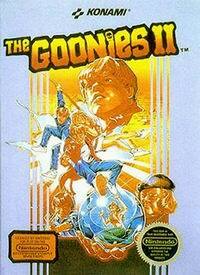 It helped that I was a Goonie fan. I went back to play this game a few years ago because I saw that it was pretty cheap, and immediately I felt...BLISS! This game is amazing. Solid graphics, amazing music, and some great platforming come together to make this an out of this world game. Not sure where this mermaid came from, though. However, like the movie, it's not the destination, but the ride that is important. I found this game is very long because of what you need to do to finish certain levels. 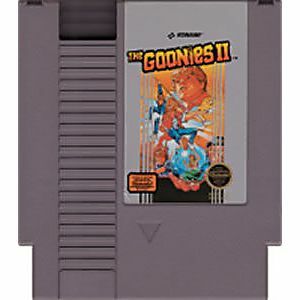 You have to find 6 goonies plus save the mermaid. It is only helpful if you have a boomerang and know what implements help you and how strong your enemies are. This game is an interesting game. It has platforming elements and some point and click style of game play. I wouldn't go as far to say it is a hidden gem. However, it is very reasonably priced so it is worth a shot ,if you don't have this in your collection, or if you remember the movie and have a soft spot for Chunk.